Earl Simons performing in the April jazz concert with the Frank Sinatra School of the Arts Jazz Band. Photo by Astra Rincon. As he adjusts his glasses on his signature dark Caesar haircut with his headset wrapped around his neck, he stands tall next to the black baby grand piano on the fifth floor at Jazz at Lincoln Center. Holding his trumpet against his lips, he sings through his horn with the beautiful language of jazz. For him, it’s just another Sunday as a Frank Sinatra School of the Arts’ (FSSA) instrumental student. 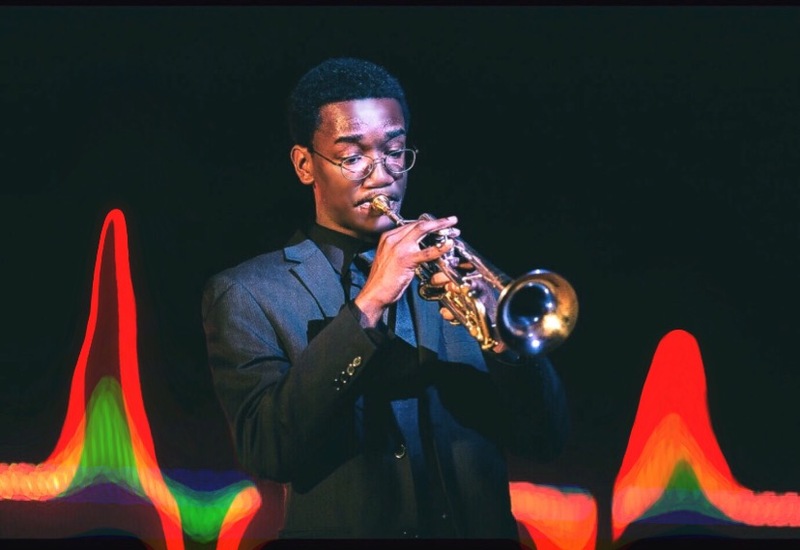 Earl Simons, the 17-year-old Queens native lives in a world of jazz, and with his gift of music, he hopes to bring jazz to others. Although he is currently a senior in high school he is looking to increase his musical gift to higher levels, to go to college, and to be a music educator. At the age of nine, Simons began his journey with the trumpet at P.S. 46Q Alley Pond. Originally wanting to play the flute, his parents convinced him to play trumpet under the music director Dr. Peter Archer. Simons listens to a lot of rap and R&B, especially old rap and R&B. He was raised with a lot of classical music until the eighth grade, when he started to listen to jazz. His interests in jazz did not grow until he met Bill Stevens in ninth grade. Mr. Stevens was the jazz band director at FSSA until he retired in 2015. He was an incredible trumpet player, and had a unique way of teaching music to young people. A whole new viewpoint and perspective was introduced to Simons by Mr. Stevens. In Simons’ eyes, Mr. Stevens impacted him with the way he approached jazz in class. Jazz began to be the music that he really liked. After Mr. Stevens left FSSA, things were not the same for Simons in jazz. Needing to have the inspiration to play jazz, he mostly listened to old Miles Davis, Louis Armstrong, Lee Morgan and Art Farmer albums. He would listen to the tonality and improvisation ideas that these trumpet players had, especially from Miles Davis. From ninth grade to twelfth grade, Simons experienced a huge improvement in his playing. He had to work hard to get to where he is now as a trumpet player. As someone who motivated him from the beginning of high school, his best friend, Sebastian Aries (also an FSSA student) inspired him as a trumpet player. Sebastian’s sound was so good, everyone liked the way he played in jazz band. During sophomore year, Simons felt kind of discouraged by the new jazz teacher, but Sebastian motivated him to keep playing. Simons would shred on his trumpet like crazy, transcribing solos, and not let anyone take him down. After he saw himself improve in his playing, he took himself to bigger places like the Youth Academy at Jazz at Lincoln center, and is currently still there. In 11th grade, he went straight into the Youth Orchestra, working with Vincent Gardner, and now Ted Nash. Simons then got involved in more jazz programs like Area All-State, and the 5-week program at Berklee college. Simons wants to teach the younger generations his concepts of viewing music, and jazz since it really made an impact on him. Simons says it’s important to inspire younger generations with music, and not to discourage them.